We at Geeks With Juniors love math. We think it's fundamental for everyone to understand at least the basic math concepts, as throughout our lives we'll need them to solve various problems. We also think it is important for juniors to be introduced to math as early as possible, so we're always on the lookout for great apps that can make the learning process enjoyable. Today, I'm going to review Love to Count by Pirate Trio, a cute and fun app for teaching basic math concepts to juniors. As the name suggests, Love to Count by Pirate Trio teaches your juniors basic math concepts through pirate-themed activities. Throughout the app, your juniors will be asked to count and order numbers, solve basic addition and subtraction, do simple division and even differentiate between left and right. 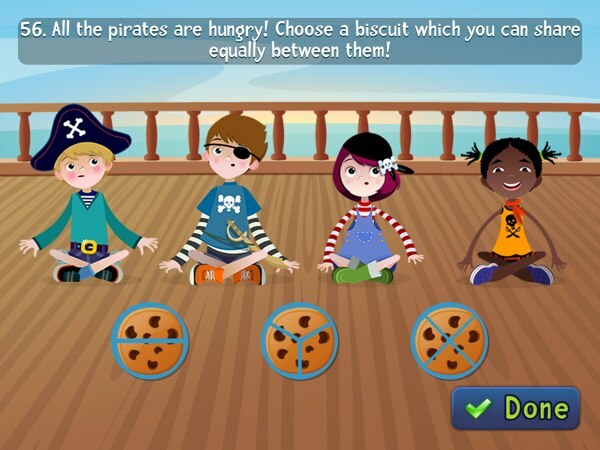 Each math problem in the app is presented as a simple activity that adheres to the pirate theme. A male narrator guides your junior through all kinds of activities, such as counting the number of spots on a stingray, arranging sailboats in the order of the number written on their sails and even balancing out a scale by adjusting its weight. There is also an activity in which your junior is asked to divide food between a number of pirates. Once your junior finishes a set of activities, he receives a letter that forms a password to the treasure chamber. When a password is completed, the chamber opens and your junior gets to choose a treasure that he can keep in his pirate chest. The app offers a wide variety of treasure that appeals to both boys and girls, including toy trucks, dolls and toy rockets. This acts as a reward system that encourage your juniors to keep playing with the app. Love to Count by Pirate Trio boasts 700 math problems to help your juniors learn. I have yet to burn through the app to confirm this, but based on the amount of time that I have spent on this app, I can tell you that there are enough math problems included to keep your junior busy. I know some parents like Eric prefer apps that have a longer lifespan, and Love to Count by Pirate Trio fits the bill perfectly. Besides offering a whopping number of math problems, the app also allows multiple profiles be set up on the same device. This is great if you have more than one child, as they can play at their own pace without having to interrupt each other's progress. The app also generates play statistics for each user, which can be accessed from the Settings menu within the app. The report includes the number of problems that were solved in total and how many of them were done on the first try. Based on my experience in using the app, I would say Love to Count by Pirate Trio would best fit older toddlers. Philip, Eric's three-year old son, was able to finish some tasks on his own, such as dividing food between pirates, counting the number of shapes and finding out the missing numbers on a clock. However, he did struggle with differentiating left from right and solving subtraction problems. The app specifically mentions that it is designed for juniors aged four to seven, and I have to agree on the age span. First, I have to say that Love to Count by Pirate Trio has a great deal of content. 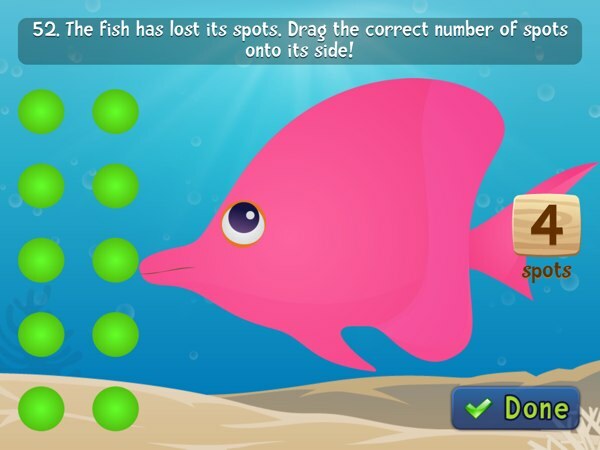 With hundreds of math problems to solve, the app has a long lifespan and great value. Also, while there is a lot of content to deliver, the app manages to emphasize on math concepts while ensuring that there is enough variety between each problem set to keep juniors from getting bored. Another thing that I love is the theme. I always appreciate apps with a theme, I think it makes the whole experience of using the app feel solid. Love to Count by Pirate Trio picked a great theme that will resonate with children; I know many kids (and even adults) are fascinated by pirates and fantasize about becoming one. The activities offered stick well to the theme and the accompanying illustrations are lovely. If I had to nitpick, I would say the app is missing a background music; a fun, nautical themed number would jazz up the app and make the gameplay more exciting. I do hope that the developer will consider adding this in future updates. Love to Count by Pirate Trio is an excellent activity app for teaching basic math concepts to your juniors. The app appeals by providing a lot of content and fun activities to keep your juniors engaged in learning. If you want to teach your juniors about basic math concepts, I highly recommend getting this app.